Tim Olsen and Joe Dustin were high school buddies at White Bear Lake in the late 1990s when they looked square into the eye of the boys hockey behemoth called Hill-Murray. A dozen or so years later Olsen and Dustin, who twice made the coveted trip to the Minnesota state tournament by breaking Hill-Murray’s hammerlock on the Section 5AA tournament, still are playing hockey together. And still striking down hockey giants. 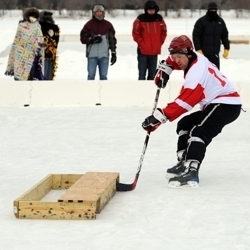 Olsen was named the tournament MVP and Dustin was described by one veteran player as “the best on the pond” on Sunday, Jan. 23, at Lake Nokomis in Minneapolis after their team, the Whiskey Bandits, outlasted defending champion Wright Homes Almost 40 9-8 in overtime to win the Open Division title in a thrilling conclusion to the 2011 U.S. Pond Hockey Championships. Fun? 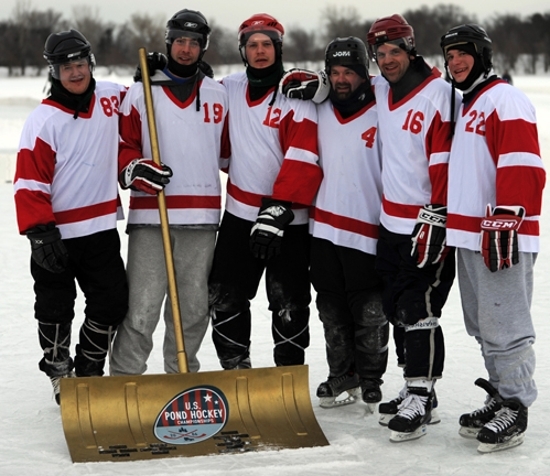 Beating Wright Homes, a team that had won three of the five previous U.S. Pond Hockey Championships titles, certainly was a feel-good experience for Olsen, Dustin and their buddies, most of whom played together at UW-River Falls. Wright Homes plays a defensively stifling style that relies heavily on puck possession and precision shooting. 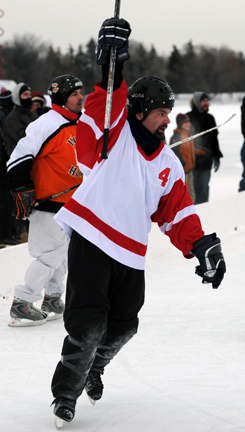 It is a mixture that has made the “boys” (Wright Homes' founders Curt Wright and Dave Bakken both are over 40) in their trademark orange jerseys one of the most fearsome teams on the pond. Steve Aronson, an assistant boys hockey coach at Minnetonka who holds the distinction of being the first player to sign a contract with the Minnesota Wild, led his Kip's Pub team against Wright Homes in the quarterfinals. 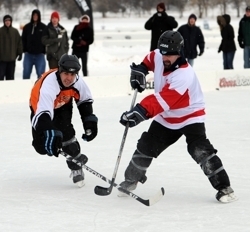 Wright Homes won 6-2 in a matchup that was intensely physical for no-check hockey. "What it takes is a lot of hard work," Aronson, who was a scoring phenom during his career at the University of St. Thomas, said about what it would take for any team to beat Wright Homes. "And, quite frankly, you have to capitalize when you get the few chances you have." As it turned out, the Whiskey Bandits played the same defensively oppressive and offensively opportunistic style as Wright Homes with the idea of beating the champs at their own game. 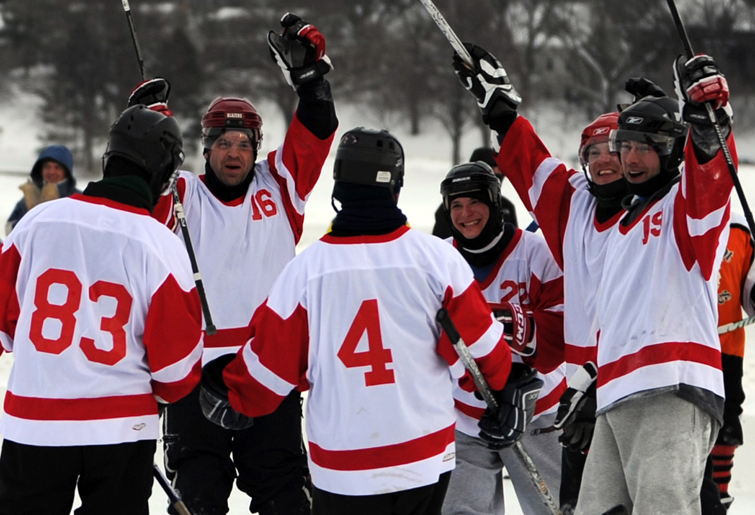 Both teams were playing their fifth game of the day and ninth of the tournament -- almost all of them in sub-zero temperatures. There was only a 30-minute break between Sunday’s quarterfinal, semifinal and championship rounds. “Exhausted. Absolutley 100-percent exhausted,” said the 43-year-old Bakken, who is the head boys hockey coach at St. Paul Como Park, after the title game. “They only thing that keeps you going out there is the competition. Everybody wants to win. A siren-beating goal to end the first half gave Wright Homes a 6-3 lead. The Whiskey Bandits closed to within 6-5 to start the second 15-minute session, but Wright Homes scored twice and was leading 8-5 with about three minutes to play. “We just wanted to get the puck on the net,” said Nick Hanrahan, who scored three straight goals in the closing minutes of regulation, including one on a long-range shot from the sideboards just seconds before the horn to end regulation time sounded. “They did a great job of boxing us out so we were finally able to get some things through. 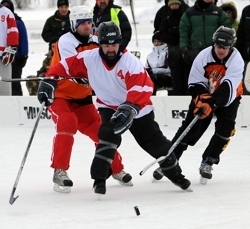 Wright Homes and the Whiskey Bandits, who won their second U.S. Pond Hockey Championships title on Sunday, had met just once previously. Hanrahan said the “team motto” all tournament was to win it one more time and retire. And now, well, the “retirement” thing is in doubt. Don’t be surprised to see the Whiskey Bandits in next year’s tournament. “We don’t know,” Hanrahan said. Olsen, for one, is taking it day by day. Starting with Monday.